Moments of Truth company Rapide wanted to bring all their mobile messaging technologies – from text analysis to broadcast SMS – together in a single document. I wrote a “story” involving a lone business traveller’s drive across the USA, engaging with various mobile technologies at key customer touchpoints. Here’s the brochure (20 folded-A3 A4 pages, 5.6Mb PDF). We all think about customer loyalty. But what exactly is it? 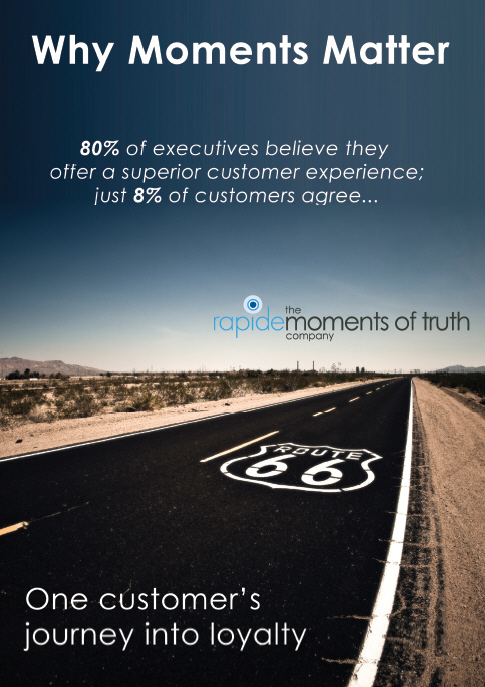 At Rapide, we believe loyalty arises at “Moments of Truth” – key touchpoints along the customer journey where engagement with the brand is unusually strong. Interact in the right way – with information, choices, even just a means to talk back – and you can turn customers into lifelong Advocates. But here’s the catch: you’ve got to do it in real-time. Not when they get home or when you email them a monthly survey. Moments of Truth happen right here, right now. Here’s a story of one business traveller’s journey into loyalty and advocacy. You’ll recognise him. After all: he’s you.